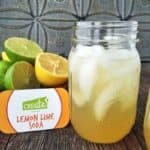 This homemade Lemon-Lime Soda recipe has no added sugar, is simple to make, and tastes great! Cut back on sugar and make your own “soda” at home! A refreshing drink for summer that’s simple to make and customizable to your tastes or what you happen to have on hand. A great way to stay on top of how much sugar is in the drinks we serve our family is to make our own. On the blog, you’ll find many simple recipes such as the delicious Strawberry Pink Drink, Superfood Smoothie, and the non-alcoholic version of the Cranberry Spritzer. But my favorite and my kids favorite is the following lemon soda recipe. A lemon soda recipe made in your own kitchen with just a few ingredients. Kids can customize the recipe and play with flavor combinations to create their very own custom recipe. A soda making bar would be a great buy generic clomid online in usa addition to any get-together, sleepover, or birthday party. Try it out today! Homemade lemon-lime soda is a healthy and tasty alternative to high-calorie sodas. Squeeze lemon into the bowl. Squeeze lime into a separate bowl. In a drinking cup, add 2 TBSP of the freshly squeezed lemon juice, 1 TBSP of freshly squeezed lime juice. Add 2 TBSP apple juice concentrate to the mixture, gently stir. Fill drinking cup with ice. Customize your soda by utilizing different fruit juices. Try adding smashed strawberries, raspberries, blueberries or other fruit blends. This is such a fun recipe idea! As a kids we always said “pop” – not sure when that changed! Love this idea! Have to give it a try over the weekend! I love this idea! So simple to make, too! Jessica – It is super simple and really fun for kids to make! Love it! It was great to see you at FNCE too! Fun idea! Sounds super refreshing! This recipe was super easy and so refreshing!